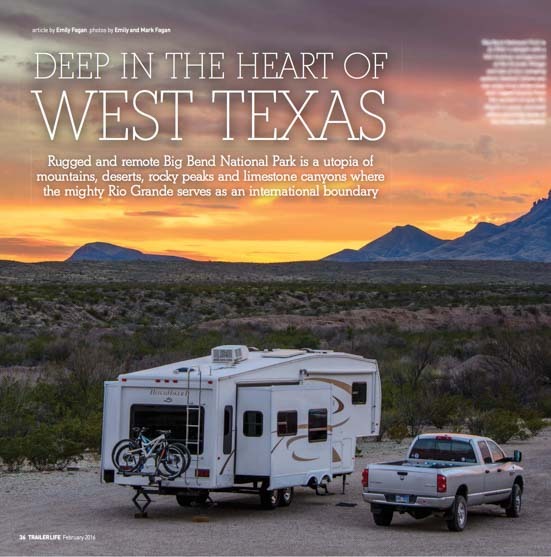 RVing Big Bend Texas – In Trailer Life Magazine! The February 2016 issue of Trailer Life Magazine features our travel story about RVing at Big Bend National Park in Texas. Big Bend National Park is extremely remote, located about 150 miles due south of I-10, an interstate that runs east-west across Texas for almost 900 miles. This extraordinary National Park offers stunning canyons, wild rock formations, towering pine forested mountains and the iconic Rio Grande, a slow moving river that separates America and Mexico. Big Bend National Park is enormous and full of variety. The drive across the width of the park is 45 miles long, and it climbs and descends through large sweeping turns that take you through many different terrains. At the far west end of the park, we found an utterly unique hippy enclave in the small town of Terlingua where the ghosts of a former Mexican mining camp come alive each year on Dia de Muertos, the Day of the Dead, on November 1st. At the far eastern end of the park we took a “ferry” across the Rio Grande (this is actually just a rowboat ride!) and we crossed the international border to spend a delightful day in the tiny village of Boquillas del Carmen in Mexico. Dusty streets, colorful buildings, and a friendly local guide who took us on a tour around town all brought back precious memories for us of our nearly four years of traveling throughout Mexico on our cruise. As close to the border as this small town is, it is as authentic in flavor and genuine in soul as any Mexican town we have ever visited. 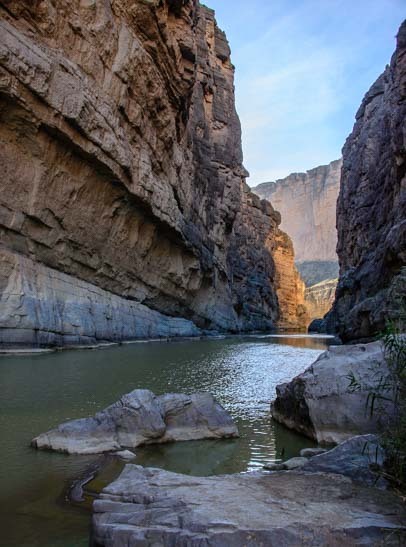 Big Bend National Park is a hiker’s dream, with short ‘n easy and long ‘n strenuous hikes available in every kind of landscape, from mountains to desert to walking along the Rio Grande. A hike in Santa Elena Canyon along the cliffs that line the Rio Grande in the southwest corner of the park gave us a beautiful glimpse of this very calm and quiet river, while a hike into the Chisos Mountains in the middle of the park took us through the pines to a window in the rocks that gave us a view of mountains in the distance. Traipsing through the hot desert portion of the park, we climbed a series of switchbacks to find ourselves face to face with a massive balancing rock. There is something in Big Bend National Park for everyone, and perhaps most intriguing is that the National Park Service operates the entire park as a dry camping campground, which makes it possible to “boondock” within the limits of the park, something no other National Park offers (that we know of). 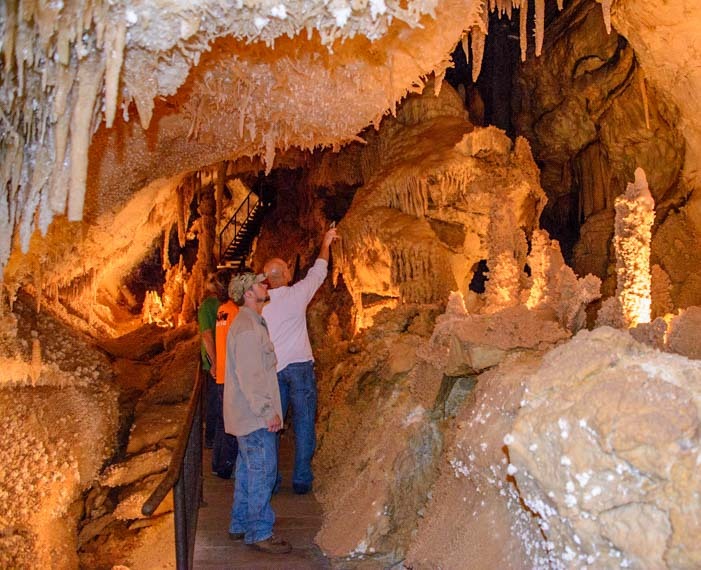 Caverns of Sonora – Enchanting Caves in Texas! Throughout the decades, Trailer Life has inspired campers with creative ideas and stories for fun things to go see and do with a trailer. They have also educated people on what to look for in a trailer, how to match a trailer with a properly sized tow vehicle, and outlined important maintenance procedures and discussed all kinds of other things related to traveling with an RV. We were avid readers of Trailer Life long before we began making contributions to the magazine, and we highly recommend it to others that are learning about RVing. Subscribe to Trailer Life here!. This entry was posted in News and tagged New, News, Non-Travel by Roads Less Traveled. Bookmark the permalink. 1. Is there a guide for Guides? You mentioned above that you had “a friendly local guide”, how do you find a reputable one where you don’t have to worry about winding up in an NBC Dateline show? My spousal unit (wife) is not as strong an adventurer as I am but your articles make me want to get up and go. Thank you for being a long-time reader. Much appreciated! You don’t need to be a big adventurer to enjoy a day in Boquillas. So, when you get up and go to Big Bend, be sure you do it (you need a passport to cross the border). When you enter Boquillas you will be given a guide by the fellow on the other side (more details in the post about Boquillas). The guide will stay with or near you throughout your visit, making sure you check in and out of Mexico properly at the border, and you can tip him if you wish. This is one way the village helps the locals make a little money from visitors that cross over from Big Bend. So fun to have your wonderful articles and photos featured in Trailer Life! Big Bend has been on our list for years, and I think we’re finally going to make it there this fall. Your articles will come in very handy, thanks! You will have a lot of fun there this fall, Laurel. Thank you for reading all our goodies and enjoy Big Bend! !